Wastewater and blood left into the drainage. Pic: KG Shashidhar. 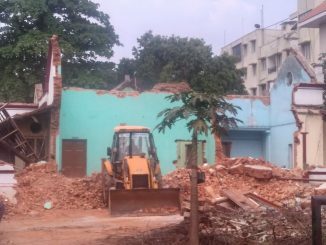 Sixteen years after the Karnataka High Court ordered the closure of all abattoirs within Bengaluru city limits and instructed the state government and the municipal authority to construct alternative facilities on the outskirts of the city, the first steps in that direction are visible. According to Dr K P Ramesh, official working at the Animal Husbandry Department in the Bangalore Bruhat Mahanagara Palike (BBMP), a new abattoir is being built on a 40-acre site within the KSIDC industrial estate at Harohalli, 34 km from the city and is expected to be commissioned by mid-2019. Not only this, concrete steps are being taken to treat the waste generated and reduce the horrendous stench that pervades the area around the slaughter house in Pottery Town, where more than 1,000 sheep, goats and cattle are slaughtered every day in the most primitive conditions imaginable. Central to this clean-up is an upgrade of the abattoir’s malfunctioning Effluent Treatment Plant (ETP) with the installation of additional equipment including a ‘digester’. 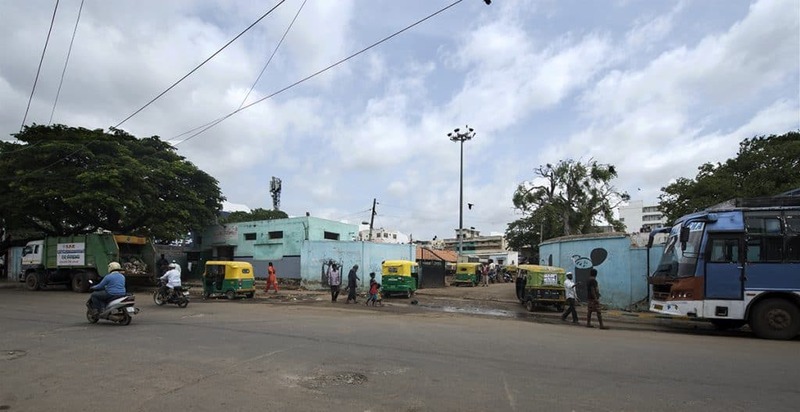 The BBMP’s engineering department is also improving the site’s sanitation to ensure that waste water is not discharged directly into sewage lines, while only treated waste streams are released into the adjacent storm water drain. The sewage lines leaving the site are being replaced with large diameter pipes to handle the flow. Collection pits for offal are being constructed and a ‘rendering’ plant is being built to incinerate all solid waste. (Hides, bone, hooves and horns are recovered and sold to contractors). The entrance to the abattoir and the yards in front of the small and large animal slaughter sheds are being asphalted, lighting inside the sheds improved and netting placed over the entire site to keep birds out. The MLA of Pulikeshinagar Akhanda Srinivasa Murthy recently told Richards Town residents that the government has sanctioned Rs. 2 crore to complete the job. Almost 100 years old, the abattoir on Pottery Road is a ramshackle operation that has continued to function in defiance of court orders, denial of consent to operate by the Karnataka State Pollution Control Board (KSPCB) or a license from the BBMP. It is managed by a loose arrangement between the Karnataka Meat and Poultry Marketing Corporation(KMPMC) and two associations of meat traders. Four departments of the BBMP enable its functioning: the animal husbandry, engineering, health and solid waste management departments, all working at cross purposes. Amritha and Hitesh Devnani, living in a premium apartment on Rogers Road, have been suffering from the stench soon after they moved in. “When we bought the apartment, the place was pleasant, with an excellent view over a neighbour’s beautiful garden. Everything seemed perfect, we had spent our life savings on it. Come April 2017, the first summer we spent in our new home, we started getting a horrible stench from the slaughter house. We suddenly realized how close we were to it and how persistent the stench was. Our maids told us that this happens every year. This came as a rude shock. On bad days it is difficult to breathe because we are forced as to close all doors and windows,” they say. A sample analysis of untreated effluent in the adjacent storm water drain by the KSPCB showed that total suspended solids had exceeded stipulated limits. And despite ample opportunity given by KSPCB, the abattoir did not comply with its standards. In 2013, the KSPCB issued an order prohibiting the abattoir from discharging any effluent outside its premises, specifically into the storm water drain. “It was observed during joint physical verification that the slaughterhouse was functioning in unsanitary conditions,” the KSPCB said, and the violations observed by KSPCB still persisted. 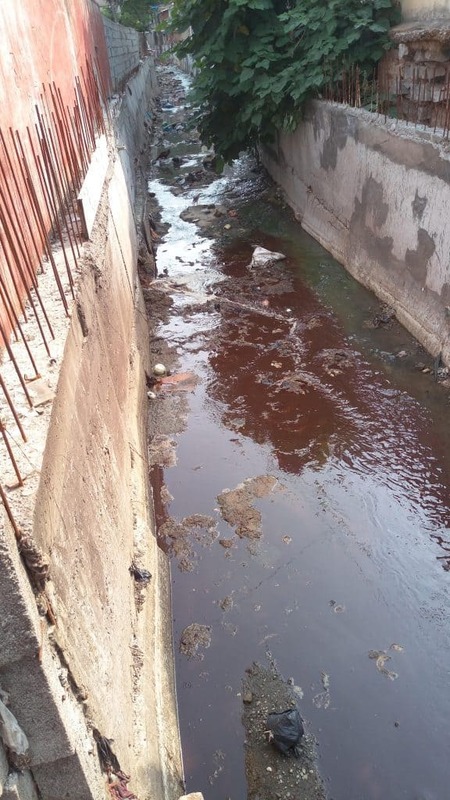 According to a 2014 KSPCB inspection report, the abattoir discharged about 3,500 litres of blood and 50,000 litres of untreated wastewater into the area’s storm water drains every day. All this in the very heart of the city: the abattoir lies just 2 km from Mahatma Gandhi Road, the artery of Bangalore’s original central business district. The court gave the government six months to shut down all abattoirs within city limits. It’s taken the government 16 years to begin to comply. That is testament as much to its fecklessness and the incompetence of the agencies under its control, as to its utter disregard for public health and well-being. Note: This article was first published in ‘In & Around’, a community newspaper belonging to the Richards Town Residents Association. Arun Subramanian is a visiting professor of journalism at Indian Institute of Journalism and New Media, and a resident of Richards Town, Bengaluru. Overdue action is welcome. Better late than never!.In fact i would suggest that Bangalore should set an example to the rest of the country by suggesting to the meat vendors that shops be set up along the lines of the western DELI where the meats are cut and displayed in temperature controlled glass displays, similar to the ones we have in shops displaying sweets in India. This would make the whole business look clean and modern. In fact, the government should bring in laws to make all retail businesses to be done only in strip mall type of buildings like they have in America where there is ample parking OFF THE ROAD….INSTEAD OF HAVING THESE BUSINESSES ON THE SIDE OF EVERY ROAD WHERE CARS, BIKES CYCLES ARE PARKED ALL OVER THE ROAD. …TYPE IN WITH THE WORDS “STRIP MALLS IN AMERICA” ON YOUTUBE SEARCH BAR, YOU WILL GET THE IDEA!. NOW HOW ABOUT THE OPEN SEWERS OF BANGALORE THAT ARE A DISGRACE TO THE CITY, NOT TO MENTION THE FILTH AND GARBAGE ALL OVER THE CITY AND COUNTRY?.